David Antony Reid is a true “hand-maker” of bespoke, contemporary and innovative stringed instruments. 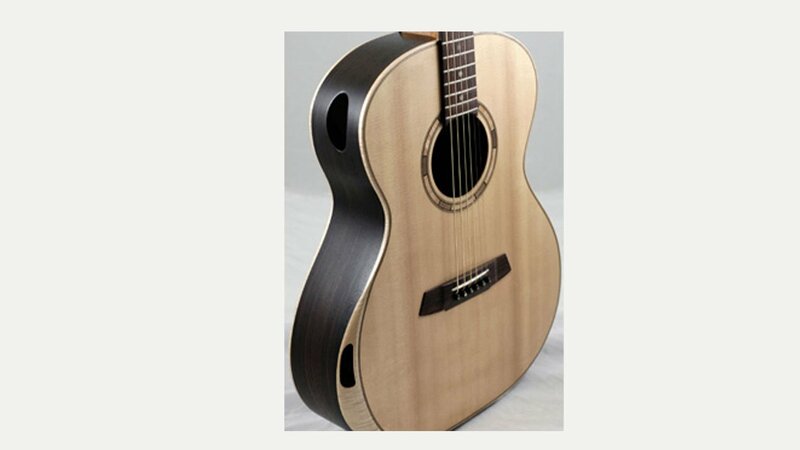 As a multi award winning luthier, David can take up to 400 hours to craft and sculpt his average guitar – an approach employed due to strong feelings regarding a constant touch-and-feel understanding of the materials and construction method used. He believes aesthetics are important, but tone and feel are his ultimate interests. Amongst his other accolades, David is credited with inventing several modern guitar construction innovations such as the double-edged-scalloped fretboard, the ergonomic guitar neck, the dual compensated saddle, the multiple frequency soundboard and the multiple diffraction/reflection back. More importantly David has been highly credited for his considerate use of materials, employing timbers such as 3000+ year old bog oak, 100 year old fallen sequoia, re-claimed old Cuban and Brazilian mahogany which had previously been fire surrounds, bank counters and staircase posts; English fruit trees, sycamores and maples which fell during the 1987 hurricane in the south of England, and the very sought-after African Blackwood from the only 100% Forestry Stewardship Council approved sawmill in the world. Due to recent, serious ill health discoveries in his lungs, David has been forced to semi-retire from Instrument making, only concentrating on one special piece a year, and emphasising more on instrument repair. He now takes very limited orders for commission, but block-books clients in to his London studio every six weeks for setups, fret dress etc, and continues to receive instruments for all repair from around the world at his Perth workshop in Scotland. Each model is created to his own specification, however he will consider variations on these themes to meet with your own specific requirements. Guitars include the Auditorium; VaultBack and The Gent.